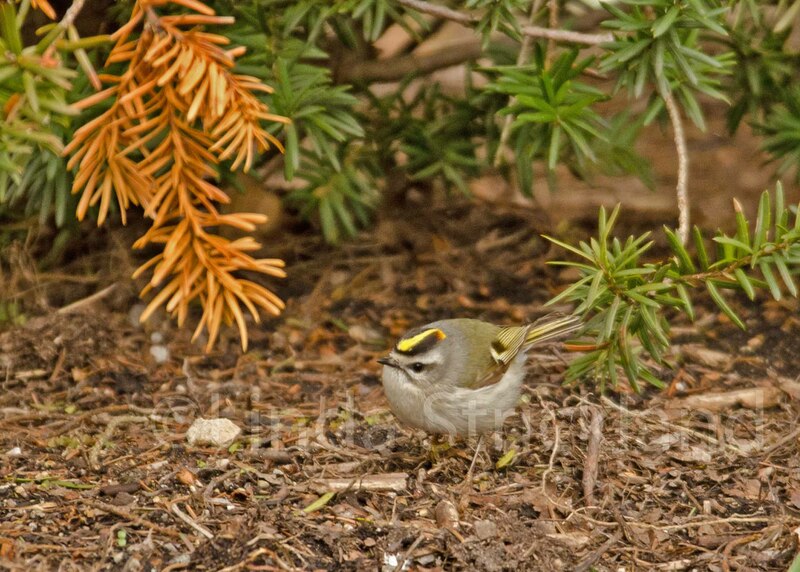 This time of year I notice the little golden crowned kinglets hanging upside down in the conifers and moving quickly from branch to branch. They are looking for insects and tree sap. This tiny bird is only 3.25 to 4.25 inches long with a wingspan of 6.5 to 7 inches and a weight of 5.3 to 5.8 grams. The reason for their name is because of the long golden stripe on the top of their head. The males have an added orange spot to go along with this beautiful golden stripe coloring. As I found this tiny little creature underneath the conifers, 2 weeks ago, I was in awe of his speed, and tried to capture even just 1 decent picture of him. It wasn’t easy! There were actually 2 of them together, perhaps the other one was the female. My friend and I were so delighted, and we tried to capture images of them next to pine cones, next to the small tulips they were dancing around. There were all kinds of contrasts to their size in plain view! Good pictures were there for the making, if only you could keep up with these little speedsters! Soon after, the Boston Marathon bombings occurred. As I looked at these tiny little lives, remembering the reverence and awe I felt, I could not help but to feel sad at the lack of respect and love that was missing from the people who were so focused on injuring and killing. This picture stands as a stark contrast to the carnage that I saw on TV a short time later. And for me, I also feel sad for the perpetrators and their families. To be so misguided and to not value all life is to be in a world of darkness. I can only hope that all of the violence and killing that we are seeing more regularily in this country, will not continue to bring on more violence, until we are all at war with each other all of the time. Someone has to break this vicious chain of carnage. And replace all of the hate with pure and divine Love and Forgiveness. That is the only cure. All of us are precious. Every single one of us. I couldn’t have said it better Maryse. About breaking the chain of hatred. That’s what I meant. Thank you for that. What a precious little bird. Yes, they are so sweet lifeonwry. Not much bigger than a hummingbird.